Ranson/Edwards Homestead Open Space Park, Jefferson County, Colorado. Northern part of open space, 1.6 mi. west on CO Highway 72 from CO Highway 93, north 1.9 mi. on Plainview Road, then 80 m. northwest; 16.3 km. north northwest of the GNIS location of Golden. 39.8977°N, 105.2687°W. WGS 1984 Elev. 1935 m. Mixed grasses and forbs, just below the ponderosa pine zone. Lightly grazed in 2016. Coll. No. 1512, 24 July 2016, characters observed: Annual, to 70 cm., tap-rooted; Leaves, cauline, alternate, sessile but not obviously decurrent, 85 mm. × 20 mm. wide, margin sinuate, spiny, adaxial thinly tomentose, abaxial tomentose; Inflorescence, panicle(? ); Heads, many, 30±, 15 mm. × 8 mm. dia., disk flowers only, dioecious, staminate heads, pappus < corolla, pistillate heads, pappus > corolla; Phyllaries, many (6-7) series, outer 3 mm. × 1.5 mm. wide, inner 15 mm. × 1 mm. wide, dark dorsal ridge, tips, spinulose, reflexed; Receptacle, soft bristles, 10 mm. ; Pappus, plumose bristles. Checklist Flora of Native and Naturalized Vascular Plants of Golden and Vicinity, Jefferson County, Colorado: Cirsium arvense. Field Notes: Coll. No. 1512, 24 Jul 2016. 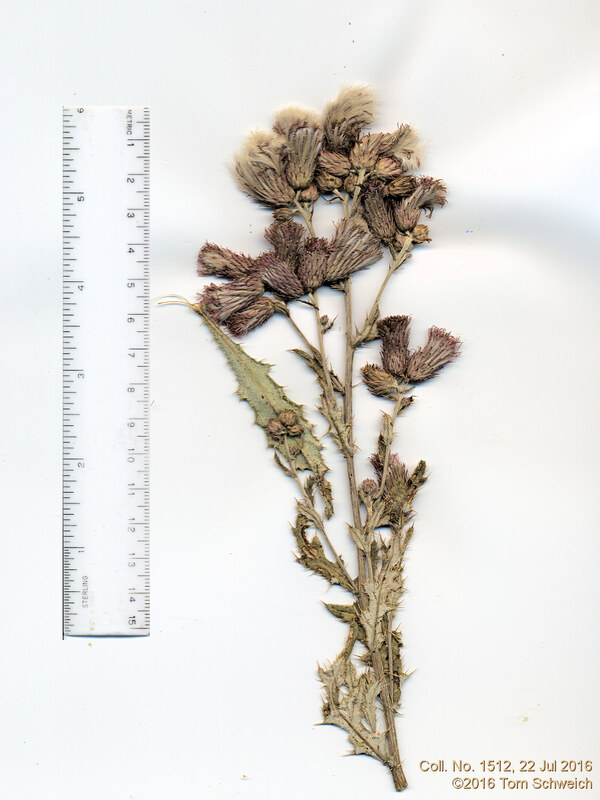 Other photos about Species - Asteraceae or Cirsium arvense.